Starting his season in four days’ time at the Tour of Oman, Tour de France champion Chris Froome has said that he is determined to prove that his run of success in 2013 was legitimate and is repeatable. The Briton, who started his run of successful GC results last year by winning Oman, wants to have another strong race, although he is not making predictions about whether or not he can triumph there again. “I wouldn’t say I have the same kind of pressure that I had last year for Oman,” he said. “I’m a lot more relaxed coming into this season, but at the same time I feel just as eager and just as motivated to get stuck into the racing. I’m really looking forward to getting back into it. 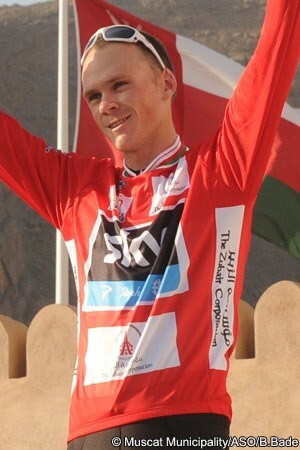 Unlike the Tour of Qatar, which finished today, the Tour of Oman is a much hillier race. This is something which suits Froome’s characteristics and if he is in anything like the same shape as last year, should be in the running for the final classification. “I want to back up everything I achieved last season and prove to people that I am a legitimate champion,” he said, laying out his season targets. “Especially in this era of cycling, there’s so much doubt around what we’re doing. I sincerely want to prove to people they can believe in this sport again, believe in me, and believe in Team Sky. I hope last year’s not going to be a one-off for me because of that would raise doubts. His Sky team-mate Bradley Wiggins stated today that he wants to return to the Tour de France, a race he won in 2012. He seems to accept that Froome is the better bet for Sky for the future, and has said that he is willing to ride for the younger Briton.